ISLE OF DOGS lies on many critics’ list as one of their most anticipated films of the year. The reason is easy to see. It has been 4 years since Anderson wowed both audiences and critics alike with the excellent THE GRAND BUDAPEST HOTEL. 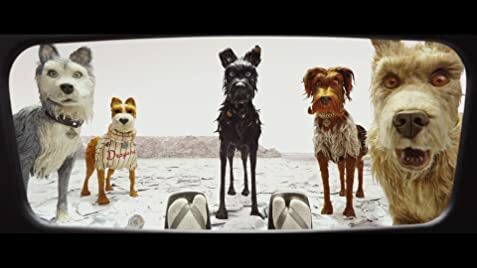 ISLE OF DOGS is also Anderson’s second animated feature after THE FANTASTIC MR. FOX and judging from that film, ISLE OF DOGS arrives with high expectations. Fortunately, these are all met. The film also won Anderson the Silver Bear Award for Best Director for ISLE OF DOGS which also opened the Berlin International Film Festival. There is hope for the dogs. A boy, ironically the major’s nephew, Atari (Koyu Rankin), ventures to the island to search for his dog, Spots (Liev Screiber). There is at least one human being who still loves his pet dog. Dogs Chief (Bryan Cranston), Rex (Edward Norton), Boss (Bill Murray), Duke (Jeff Goldblum), and King (Bob Balaban) help him search for Spots and evade the authorities. Eventually Atari discovers his uncle’s plot to eliminate all dogs on the isle and with the help of the dogs led by Chief saves the dog world. The film is enough to seriously have audiences consider getting themselves a pet dog after watching the moving saga. The film is shot in both English and Japanese. The dogs speak English which English audiences understand while the humans speak Japanese which the dogs (and audiences do not understand). This is a brilliant concept which is even more brilliant when one considers the reverse effect when Japanese watch the film. The ensemble voice cast is impressive but largely wasted as many of the voices cannot be recognized. Even Yoko Ono is on the list, but very few know what she sounds like, less alone the more famous stars that include Ken Watanabe, Frances McDormand, Harvey Keitel, Scarlett Johansson, Greta Gerwig, just to name a few. On originality alone, ISLE OF DOGS scores 100% which makes it one of the first 10 best films of 2018. Boy! What a movie!